Dellorto Weber genuine synchrometer carb. balancer made in Germany not China! Can be used for all Weber DCOE and IDF and Dellorto DHLA, DRLA carbs.with round intakes or trumpets. Other Dell'Orto and weber carbs. The original genuine high quality German made product. Methanol, also known as methyl alcohol, wood alcohol, wood naphtha or wood spirits, is a chemical with the formula CH3OH (often abbreviated MeOH). Methanol acquired the name "wood alcohol" because it was once produced chiefly as a byproduct of the destructive distillation of wood. Modern methanol is produced in a catalytic industrial process directly from carbon monoxide, carbon dioxide, and hydrogen Applications - As a Lab Solvent - Antifreeze Additive - Denaturant for Alcohols - Racing Fuel Additive - Methanol Fuel - Typical Usage for Methanol Racing Fuel - Speedway - Water Injection Systems - Circuit Race Cars Methanol used for biodiesel production guidelines - typical usage rates - 20 Litre's of Methanol will produce between 80 - 120 Litres of Biodiesel. - 200 . 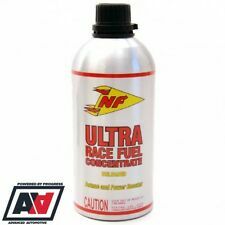 NF Ultra is a fully synthetic racing octane booster that not only raises octane more than its competitors, but also includes a power booster which increases the energy in the fuel, giving even better performance. A Bosch 044 Equivalent Hi High Performance Fuel Pump. Made By HI 100% Genuine And An Ideal Alternative To The Popular And More Expensive Bosch 044. 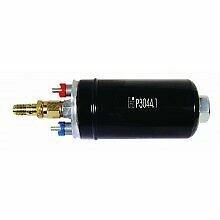 Equates To The Bosch 0580254044 And ATL PU-AB-030 Fuel Pump. It can be used with a fueling nozzle and filters for ensuring the flow of clean Fuel Oil or kerosene. With inner bypass valve and excellent quality, it works by vehicle battery, with good self priming function, pump is also equipped with filter. This is an electric suction/pressure fuel pump, part number 133010 for use with single or twin carburettors to be. The pump is marketed by Webcon & made in Germany. mounted upright in the engine bay. Connector Type: EV1. Design: Bosch GEN III EV1 Style Fuel Injector. NOTE THESE HIGH PERFORMANCE INJECTORS WILL REQUIRE ECU TUNING. 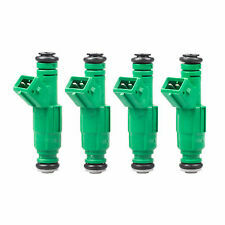 Quantity: 4 Fuel Injectors. These High Impedance(Approx. 12 OHMS) Saturated injectors will fit all of the following models. FORD ZETEC 1.8/ 2.0 TWIN WEBER "SHORT" INLET MANIFOLD - NEW - FREE SHIPPING! Ford Zetec inlet manifold to take 2 x Weber carbs or throttle bodies. Fits all the Zetec "E" engines, 1.6/ 1.8 and 2.0 with the cast iron engine block. 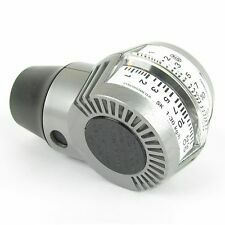 It is short, about 65mm which makes it suitable for fitting in tight spaces. Can be used for all Weber DCOE and IDF and Dellorto DHLA, DRLA carbs.with round intakes or trumpets. SU type adaptor will suit HS2, HS4, HS6, HS8 etc. Opening Hours. A Top Quality Genuine STE Product Made In Germany. Low pressure pump for Carburettor Vehicles. This is an outstanding, lightweight universal Facet electronic fuel pump with state-of-the-art design that can be used in all carburettor-equipped vehicles and also as a diesel lift pump. Malpassi Fuel Pressure Regulator For Fuel Injection To Carb Conversion. Can also be used for turbo conversions that are using a carburettor. HAS 1 X 8mm INLET & 1 X OUTLET FOR PUSH ON FUEL HOSE. Because of the vast range and product types, many parts may appear to be correct and then are not. Can be used for all Weber DCOE and IDF and Dellorto DHLA, DRLA carbs.with round intakes or trumpets. Other Dell'Orto and weber carbs. The original genuine high quality German made product. Instructions included. BG 245 for diesel rapidly removes harmful engine deposits. BG245 is a d iesel specific complete fuel system cleaner. It cleans valves, injectors and the combustion chamber of soft and hard baked carbon. Total length of pump: 180mm (7"). compatible with fuel injection cars up to 250 BHP. Motor : 175W. Not suitable for Flammable liquids, e.g. petrol. 12V Portable Electric Pump Diesel Oil Transfer Pump 40L/Min. Special oil pump self-priming pump for diesel. Should not be used for low ignition point and high viscosity oil gas gasoline. It can fit other carburetors using the adapters available. These are for synchronizing all multi-barrel or multi-carburetor automotive applications. Because of the vast range and product types, many parts may appear to be correct and then are not. Can be used for all Weber DCOE and IDF and Dellorto DHLA, DRLA carbs.with round intakes or trumpets. and official Weber dealer. Other Dell'Orto and weber carbs. Length of cone 36mm. A Top Quality Genuine STE Product Made In Germany. Because of the vast range and product types, many parts may appear to be correct and then are not. Billet Aluminium Inline Adaptor. 2 Brass 8mm Hose Tails For 8mm Bore Fuel Hose. Brass Blanking Plug For When The Gauge Is Removed So The Above Adaptor Can Be Left In The Fuel Line. 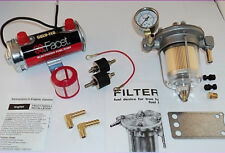 A QUALITY SYTEC CARBURETTOR PRESSURE TEST KIT. Connect the oil gun directly. When you turn off the oil gun, the oil can circulate directly in the pump. Type: Diesel Fuel Oil Pump. Thickened joint, good strength, high sealing, no oil leakage, free from the joint gap. The balancer can also be used without the adaptor. Can also be used for all Weber DCOE and IDF and Dellorto DHLA, DRLA carbs. with round intakes or trumpets and motorcycle carburettors with round intakes. 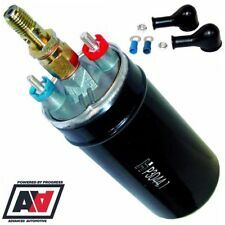 Low Pressure Electric Fuel Pump Universal. each pump tested by the manufacturer. BRAIDED HOSE NOT INCLUDED - (Shown For Illustration Purposes Only). HOSE NOT INCLUDED. Products only fit models stated (if products fit other models its in our favour to say so!). 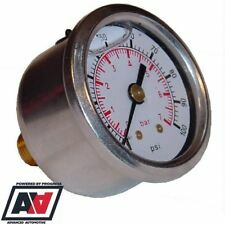 Genuine Malpassi Filter King Fuel Pressure Regulator And Gauge. This is a genuine Malpassi quality product. 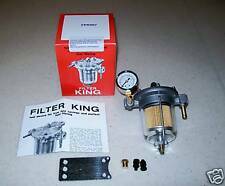 The FILTER KING is a popular unit, regularly seen in the motorsport field because of its ability to regulate and filter fuel without restriction. 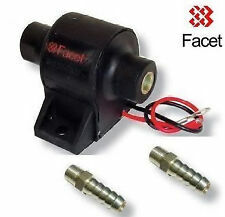 Facet Solid State Electric Fuel Pump Cube supplied with pair of 8mm unions --- Facet Pump Part No. 40106 / ss502, --- 12 volt negative earth, pressure 4.0-7.0 psi --- Flows 32 US Gallons per Hour --- 0.3 metres Prime Height --- 1/8nptf Thread Size. Facet Cube Fuel Pump Information: All models of the Facet Cube Fuel Pumps are compatible with gasoline, diesel, biodiesel, blended alcohol fuels and fuel additives. With Solid State Reliability that is proven on thousands of original equipment applications. No electrical contacts, no bearings or diaphragms to fatigue. Two-bolt installation plus the small size makes installation easy. For best results, mount the pump close to the fluid or fuel tank. When properly installed a constant, dependable supply of fuel under pressure is assured. All types of petrol and diesel injectors for what we believe to be the best price. Thismotorsport quality, universal regulator enables fine tuning of the fuel/air ratio of the mixture entering your engine. It can be used with a fueling nozzle and filters for ensuring the flow of clean Fuel Oil or kerosene. Suitable for pumping Fuel Oil and kerosene, allows pumping of clean oil with low viscosity. Fuel Oil or kerosene transfer is in the direction of the arrow as indicated on the pump. Billet Aluminium Inline Adaptor. 2 Brass 8mm Hose Tails For 8mm Bore Fuel Hose. Brass Blanking Plug For When The Gauge Is Removed So The Above Adaptor Can Be Left In The Fuel Line. A QUALITY SYTEC FUEL INJECTION PRESSURE TEST KIT. Connect the oil gun directly. When you turn off the oil gun, the oil can circulate directly in the pump. Exquisite base, which can be fixed on the surface of the object with screws, greatly increase the working range of the oil pump. 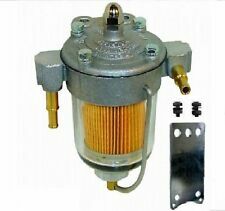 Low Pressure Electric Fuel Pump Universal. 1 x 12V Electronic Fuel Pump. each pump tested by the manufacturer. Pressure 1 mpa. Lightweight and small size. Easy to fit and connect. Note: This product is bigger than others,and the quality is highly and material is all cooper. Sytec Motorsport Hi Flow Fuel Filter With 12mm Hose Tails. Inlet :- For 12mm Bore Push On Fuel Hose. Outlet :- For 12mm Bore Push On Fuel Hose. 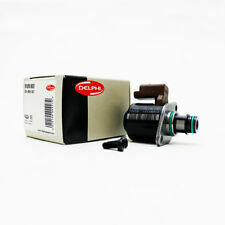 Filter Length mm:-170 mm. Because of the vast range and product types, many parts may appear to be correct and then are not. 13mm 1/2" RUBBER SERVO HOSE TUBE PIPE 1 MTR. Other Dell'Orto and weber carbs. The New Carbtune pro and storage case- essential for balancing carburrettors. Adapters will suit DHLA & DCOE carburettors and many motorcycle carburettors. Full instructions. Non-genuine external in-line fuel injection pump replaces Bosch 0580464070. Fast high pressure flow.